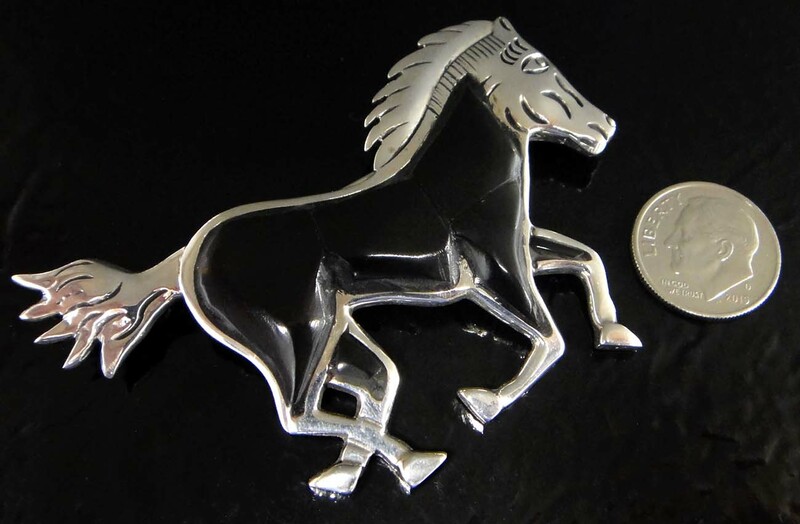 This handmade black onyx and .925 sterling silver brooch depicts a wild running horse. 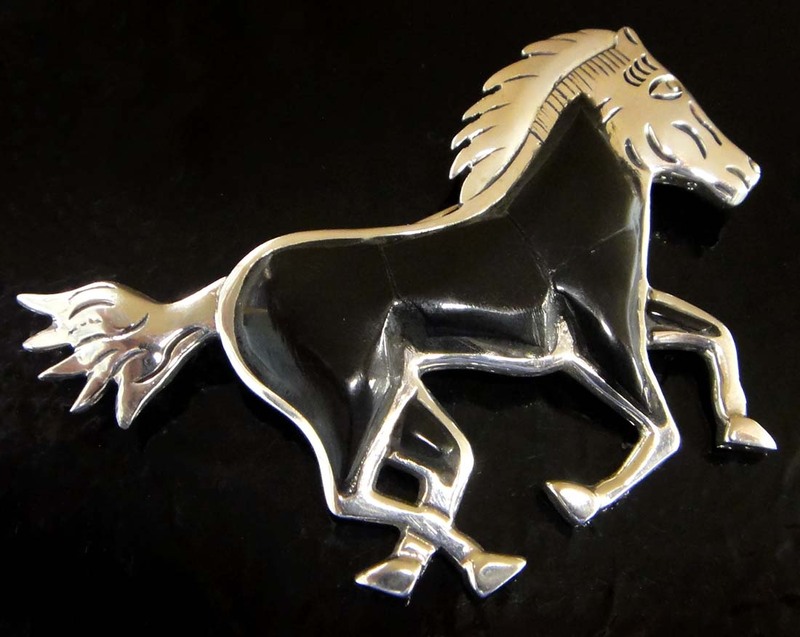 The horse’s body is made up of the smooth and polished black onyx, while the head, tail, and feet of the horse have great detailing. This handmade black onyx and .925 sterling silver brooch depicts a wild running horse. 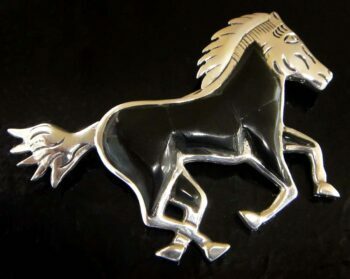 The horse’s body is made up of the smooth and polished black onyx, while the head, tail, and feet of the horse have great detailing. 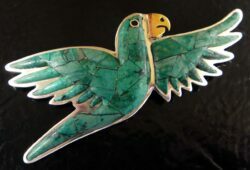 This pin was handcrafted in Taxco, Mexico, a city that is world famous for the beautiful silver-work created there. The brooch utilizes a sturdy pin back running across the back that is easy to attach securely to coats, blouses, or any other fabrics. 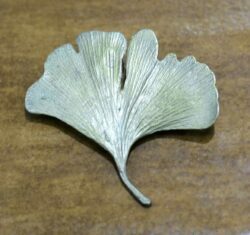 The back of the pin is stamped with the artist’s name and “925” so you can rest assured you are getting genuine sterling silver jewelry. This horse pin measures approximately 1.75″ tall (measuring from the top of the head down to the end of the horse’s feet). 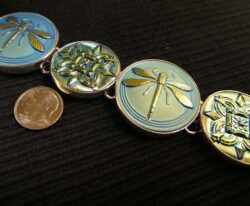 At its widest point, the pin measures approximately 2.75″ across. Please note that the dime is not included but is shown to help you gauge the size of the pin. 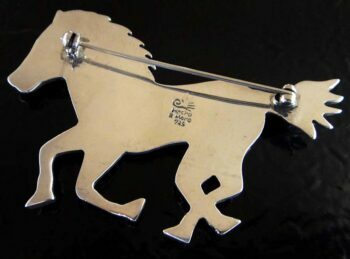 This brooch pin would make a great gift for anyone who loves horses, animal pins, or handmade sterling silver jewelry. This brand new brooch comes with our original store tags and gift box, great for giving or storage for years to come.